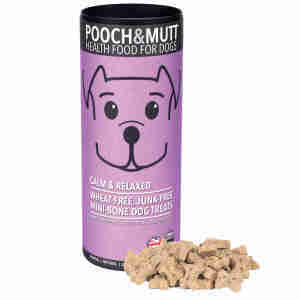 Give your dog a treat they'll love with these ethical Pooch & Mutt Calm and Relaxed mini bones. Treating your pet for good behaviour or if you're trying to teach them tricks is a great way to make them feel rewarded and special. These snacks are hand-baked and completely natural, so they're ideal if your dog has a sensitive stomach or food intolerance. In addition to tasty lamb, the treats also contain natural chamomile, which can help your pet feel soothed and relaxed – much the same way the tea affects us humans. There's also L-tryptophan, which is a form of serotonin – a neurotransmitter that helps your dog feel good. In addition to being used in training or as a reward, treats have another very useful function – calming your pet in stressful situations. If your dog hates fireworks or travelling, the serotonin and chamomile in these treats will naturally relax them and make them to feel at ease. They're low in calories as well, which means you can be a little more generous with them than other snacks. If you have a rescue animal, these treats could be used in place of regular ones, especially if they're having trouble getting settled in their new home. If this is the case, or if your dog seems to get particularly stressed during loud events or when you leave the house, speak to your vet for some advice on the best way to keep them calm and happy – they might recommend these treats as part of the process. Bought for my sister's nocturnal pooch. They work wonders even though sometimes she has to have two.